Ahoy mates! 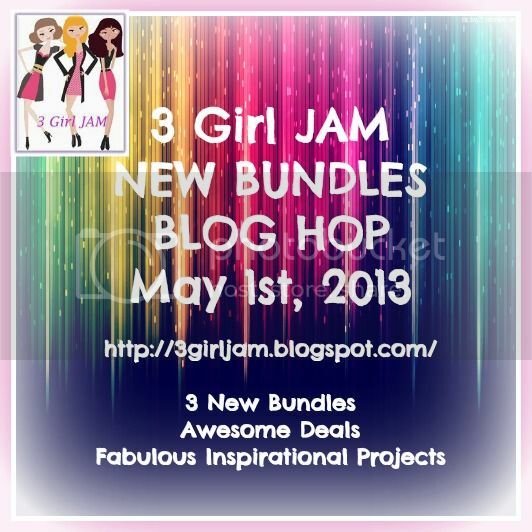 Today I'm participating in a special release and blog hop for 3GirlJam's May Release! I won't keep you too long, but you'll want to make sure and participate in the hop this weekend. The prize for participating in the hop is 1 bundle of each of the new sets of ribbon! Pretty cool, eh? And check out the specials available for a limited time (through Sunday, May 5)...especially if you're in the market for some of the wonderful crinkle ribbon, it's ALL on sale for 20% off! This is so pretty. I really like the silver button attached to your ribbon. It adds a great touch! Hi Rebecca. Very awesome masculine card! I love that ship stamp! I am already a follower of your blog. Beautiful card, love your use of the ribbon! Great card design! love the nautical theme Rebecca, beautifully done!! Great card!!! ribbon suits it perfectly! Gorgeous card! Loving the new colors! Love Love Love your card!!! I am following your blog. Gorgeous card and I was already a follower of your blog! I love to sail, so your card strikes a chord with me. Beautiful work, my friend! Love, Love, Love this card. The anchor tag is so cute. Darling layers and textures! Wonderful masculine card!! I really like the hanging anchor tag. Another wonderful card, Rebecca! I love how you put together all of your elements for a great masculine card! The navy crinkle ribbon is fab! Wahoo! great use of ribbon! your card is super cute and love the clean feel of it! So creative. Awesome card!! The blue ribbon works so well with your nautical theme!! I knew it!! I knew I was going to be blown away when I saw the sneak peek you gave us : ) This card is beautiful!! The embossing is perfect for the theme. Awesome card. this turned out great!! love the way you used the ribbon with the button! very pretty card. very cute way to use the ribbon. Very pretty card!Love the ribbon! Fabulous! Love the masculine feel of the card. My hubby and I are boaters....so anything marine related always catches my eye! This is such a perfect project to showcase the Navy Blue. Great job Rebecca! 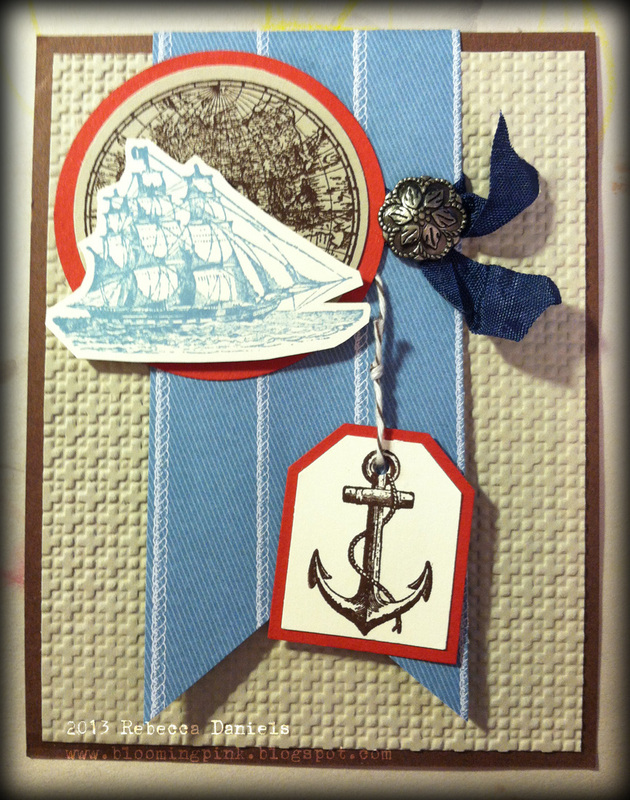 Cute nautical card! Perfect with the blue crinkle ribbon!!! Wtg!! Love how your blue ribbon looks like it is sailing away. I love your card! It is CAS but amazing. Great hop! I love your card. My nephew is in the Navy so this theme and colors are dear to my heart! I am a new follower and fan. Your creations are inspiring. Thanks for sharing with us. Such a cute card!! Love all of the new colors.